This episode of Life is the story of a group of friends trying to make it in the world's most socially divided society, Brazil. They call themselves 'The Posse' and they live in Sao Paulo, in one of Brazil's 2500 favelas or urban slums. The Posse is centered around a rap group whose songs explain the inequalities of life in Brazil today. Its members include schoolkids, the unemployed, social activists and university students. Beyond the boundaries of the favela, the program films with those who live in even worse conditions, in rat-infested city shelters for the homeless, as well as with the new urban elites: lawyers and a young man who has just made millions from an internet company. Even if kids like those in The Posse do -- against all odds -- win a place at university, educators, economists and lawyers explain, social differences may stop them becoming part of the elites who stand to benefit most from Brazil's rapidly growing and globalizing economy. 1. Life: The Story So Far - How the globalized world economy affects ordinary people. 2. Geraldo Off-Line - Globalized economy affects Brazilian factory worker. 3. From Docklands to Dhaka - English MD travels to Bangladesh to improve community health. 4. An Act of Faith: The Phelophepa Health Train - A group of health professionals tours the most deprived regions of South Africa providing care. 5. The Philadelphia Story - Globalized economy affects American jobs. 6. The Boxer - Young male looks to escape Mexican poverty by becoming a boxer in the United States. 7. The Seattle Syndrome - Were the WTO protesters right in their effort to protect workers and the environment from exploitation? 8. The Right to Choose - Women are denied human rights in Ethiopia and northern Nigeria. 9. At the End of a Gun: Women and War - The devastating effect that the civil war in Sri Lanka is having on women. 10. The Summit - The UN General Assembly meets to review progress on social justice worldwide. 11. All Different, All Equal - Examines progress in women's rights globally. 12. India Inhales - Activists combat tobacco companies that target India. 13. The Silver Age - Growing population of elderly worldwide seeks purpose and care. 14. The Cost of Living - AIDS drugs unaffordable in developing countries. 16. Credit Where Credit is Due - Micro-credit organization in Bangladesh provides loans to village poor. 17. Regopstaan's Dream - Bushmen fight to live on ancestral land in South Africa. 18. Untouchable? - The caste system and bonded labor are still alive and well in India. 19. Because They're Worth It - Micro-credit, education, health information, and hope provided to impoverished Chinese. 20. For a Few Pennies More - Iodine deficiency causes health problems in Indonesia. 21. In the Name of Honour - Kurdish women fight for their rights in Northern Iraq. 22. God Among the Children - Community organization works with at-risk youth in Boston. 23. Without Rights - Palestinians are denied human rights. 24. Lost Generations - Poor health and poverty condemn people in India to sub-standard lives. 25. Educating Lucia - The odds are against girls getting an education in Zimbabwe and throughout much of Africa. 26. A-OK? - Examines prospects for Vitamin A distribution programs in Guatemala and Ghana necessary for children's health. 27. Bolivian Blues - Explores the success of new initiative to reduce widespread poverty. 28. The Outsiders - Explores the moral and economic dilemmas that adolescents face in the Ukraine today. 29. The Debt Police - Uganda seeks external debt relief and fights internal corruption. 30. The On-going Story - Final episode examines the international community's commitment to linking social and economic development with human rights. NOTE: A second series called City Life is now available. "Documents the tenacity of Sao Paulo's most impoverished residents in their struggle to overcome the limitations of shocking deprivation." Explores Sao Paolo in introduction to series examining the effects of globalization on people and cities. Porto Alegre, Brazil has benefited from urban revitalization. Social change is possible through the arts and humor. Economics and the murder of street children in Rio de Janeiro. How much do teens have in common worldwide? 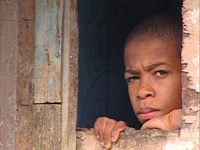 A young Brazilian athlete hopes soccer will be his ticket out of poverty. Teens worldwide consider their futures. What impact will Western culture have? The globalized economy affects Brazilian factory worker.